The StressLocator app offers two modes: easy and expert. 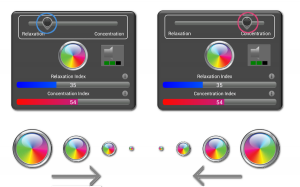 The easy mode displays information about the heart rate and basic information about the mental state of the user, simplified to the stress index and the relaxation index. The expert mode allows the user to display more detailed information on heart and nervous activity of the user, which provide a complex overview of their mental state. Learn more about your physical and mental state. Reduce the amount of stress that affects you. 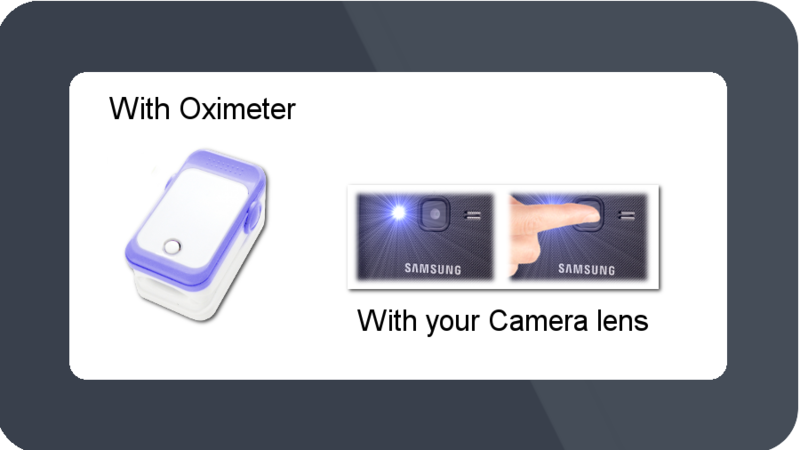 You can test the app by measuring with the camera of your device, but best results are reached using our Oximeter. The app is an ideal tool for planning your daily activities. In just a few moments, you can enhance your ability to concentrate or relax with our biofeedback training and immediately check your progress. StressLocator offers instant results, it is easy to use and even the free version gives you many useful functions. Breathing exercises with biofeedback will help you concentrate or relax. You get immediate overview of your progress. The interpretation of all data is based on long-term scientific research and analysis. The physical stress index is based on your heart rate variability. It shows you the percentage of your currently available energy. This is the index measured by apps like StressCheck or sHealth. The concentration index shows you, how well you are able to concentrate on your current activity. The relaxation index tells you, how well you are currently able to relax. Just insert your finger and press the button on top of the device. Before starting the app you have to pair the oximeter with your device (see in the video). The measuring is extremely precise, without complications associated with using the lens of your mobile device (lens temperature, keeping your finger still). Just put your finger on the lens of your devices camera. Using this method will give you less precise results. Devices equipped with a strong flash may get hot. We recommend using the oximeter. Lower heart rate is common for athletes with trained hearts. SpO2 displays the percentage of oxygenation of blood in your body. The value is individual and can be as low as 80%, depending on your previous physical activity. Heart rate variability displays variability between individual heartbeats. The higher the variability, the better the physical condition of your body is. If the variability is low, your organism is tired. One of many methods, used to monitor heart activity. It can be used to diagnose some heart diseases and to check if your heart is functioning properly. Displays your heart rate in time. It can be influenced by many factors, like sport, mental activity or a stressful situation. The app is available in two versions. StressLocator Free is available for download freely on Google Play and allows you to try our app and its functions, including biofeedback. However, some functions are limited. StressLocator Pro is a paid version, which brings you several advantages – it gives you access to the expert mode with graphs and precisely measured data, instead of just a simplified description of your mental state. You can view your previous results and compare them. When using biofeedback to enhance your mental state, you are not limited by time, so you can achieve much better results. An easy game controlled only by your will. The faster can you concentrate, the better results can you reach. 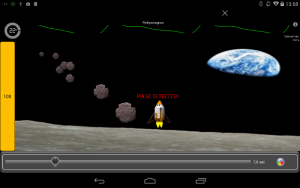 The game is designed for use of the oximeter, the concentration is calcullated similar to the StressLocator application. The game doesn’t offer only fun, but it can help you to rech better result in self-controling as well. 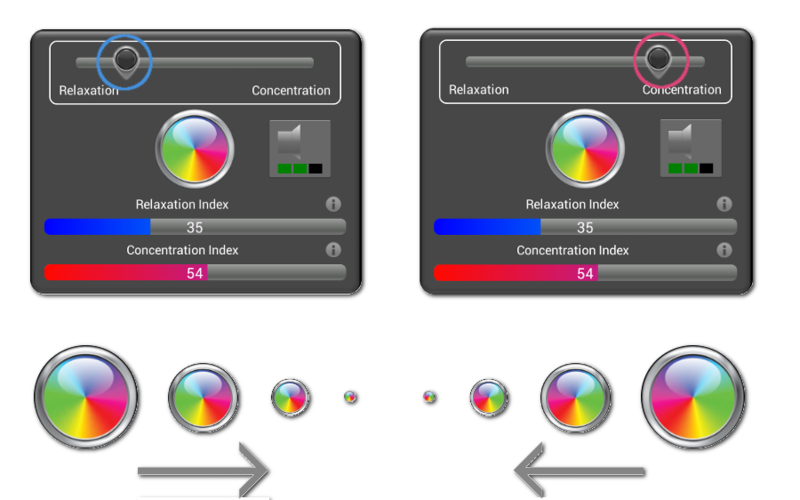 Here you can choose whether you want to enhance your concentration or your relaxation levels. Just slide your finger over the slider. Everything depends on your current needs. Your selection changes the rate of breathing from slower (for concentration) to faster (for relaxation). Enhancing your concentration and relaxation levels happens through controlled breathing. For that, use the colourful metronome (the round indicator in the app), which grows and shrinks. As the indicator grows, breathe in. As the indicator shrinks, breathe out. The two phases are separated with a sound. You can change the sound volume, depending on your preferences. HRV graph is designed for therapists and expert users, it displays the power spectral density of your heart rate variability. You can compare how active is your sympaticus and parasympaticus, displayed as harmonic sinusoid waves. The sympaticus is responsible for activities that prepare your body for an immediate reaction (act, fight, flight…). If sympaticus prevails in the graph, your organism is prepared to immediately react (conscious concentration). Your heart beats faster, your blood flows faster and your organism is ready for immediate changes. The parasympaticus affects activities connected with rest and replenishing energy. Your body concentrates on regeneration. If parasympaticus prevails in the graph, your body is relaxing and isn’t prepared for challenging activities. We thought it might be interesting to share results and find out where the stress levels are highest, and where they are lowest. You can compare results on the level of cities, or worldwide. We are curious about your results and where in the world is the best place to live. Whe hope that you are too! Check out our map at http://www.stress-locator.com/maps. Are you competitive? You can easily get into the world Top 10 ranking. :) Try the breathing exercises, enhance your mental state and your relaxation and concentration levels. You can repeat the exercises as many times as you want. The world Top 10 ranking can be found under the button “Contest” in your app. Good luck! Our oximeter with the app for both Android and iOS platforms can give you a complete insight to your actual physical and mental states. Are you exhausted? Do you need a rest? Are you capable of full concentration? By using our apps linked with the oximeter you will get a perfect tool for monitoring your physical and mental states in order to improve your health and wellbeing. For more information please visit our e-shop. For more info, see the support page of the product. For download User’s Manual in English, see the page.